Happy new year, ladies and gents. Hope you all had a super fun time ringing in 2014, and are off to a good start with those resolutions! 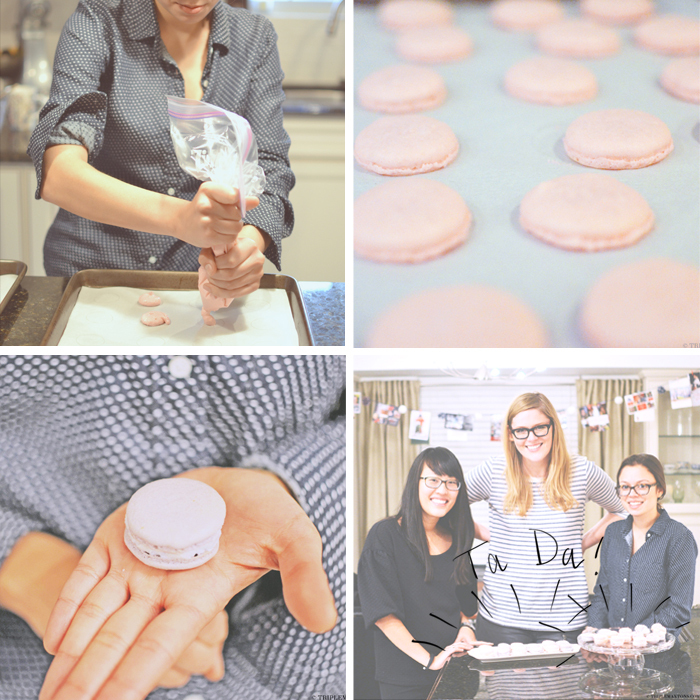 While most people are chattering about dropping a few jeans sizes, I was busy getting a sugar high and conquering the finicky little macaron in the kitchen with my high school bestie, Megan, and Mei, her very cool roommate, who both took a quick jaunt to visit Austin over Christmas break. You see, these finicky little buggers have been on my list of skills to acquire since 20-freaking-12, alongside nun-chuck skills, bow-hunting skills and computer hacking skills. Ha, not really...but I'm doing well on my resolution to drop random quotes into casual conversation from only the best cinematic masterpieces of all time. So, +1 point there. Anyways, after several epic attempts resulting in impressive failures (we hit every single problem on the list...go us! ), I can finally swish a triumphant check mark on that box because, y'all....WE DID IT! We conquered the elusive macaron. Now, this wasn't any regular ol' walk in the park. I trained for this bakefest like a marathon runner. I ate macarons, I studied macarons, I spent an absurd amount of time watching tutorials on Youtube and reading this book. With a little mixing and matching from both, I felt like Rocky ready for battle against these adorable little crunchy and chewy delights. My rec for a successful batch? Watch this great macaron tutorial from Honeysuckle Catering. I think the three of us can recite it word for word now. 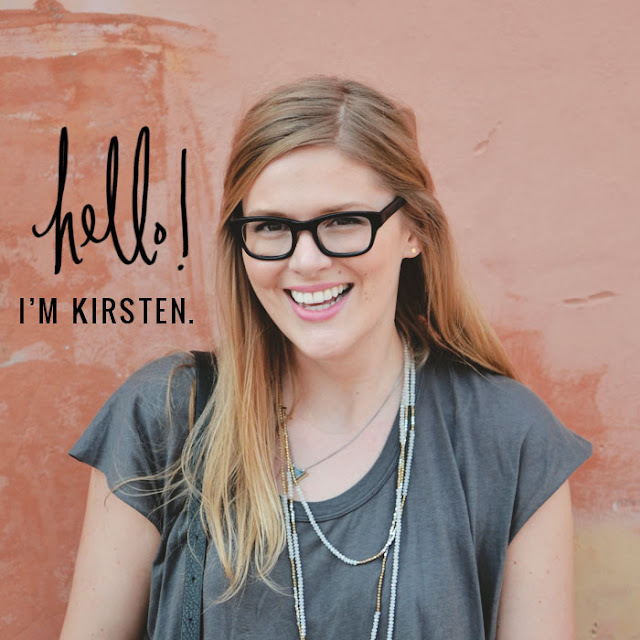 ;) The recipe that she, and consequently we, used is adapted from the queen of impossible recipes herself, Martha Stewart. I'm not going to lie...I was a little worried these wouldn't turn out, but having video proof helped us forge onward. So, here's the how-to with my notes and recommendations that I picked up from reading the book. Sift confectioners' sugar and almond flour until combined. Whisk whites with a mixer on low speed until foamy. Add sugar while increasing speed to medium and whisk until soft peaks form. (TMT notes: Now is the time to add food coloring to the whites, if you want to.) Increase speed to high, and whisk until stiff peaks form. Slowly add the egg whites into the flour and powdered sugar mixture and fold until mixture is incorporated. Transfer batter to a pastry bag fitted with a 1/2-inch plain round tip, and pipe 3/4-inch rounds 1 inch apart on parchment-lined baking sheets, dragging pastry tip to the side of rounds rather than forming peaks. (TMT notes: You must have evenly sized rounds for them to bake at the same speed and avoid imminent disaster. To do this, use a biscuit cutter and pencil to trace evenly sized and spaced rounds on parchment paper. Make the lines dark enough so you can see through the paper. Flip the sheet over so the pencil marked side is facing down. Actually, do this step FIRST so you don't let your batter dry out in the bowl while tracing all these circles.) Tap bottom of each sheet on work surface to release trapped air. Let stand at room temperature for 15 minutes (TMT notes: You want the macarons to not stick to your finger when you touch them. We had to let them dry for 20 minutes for the first batch, and 22 mins for the second.). To make my favorite buttercream filling, you will need 3 large egg whites, 1 cup sugar and 1 cup (2 sticks) unsalted butter, at room temperature, cut into pieces. In the bowl of an electric mixer, whisk egg whites and sugar. Set mixer bowl over a saucepan of simmering water and heat mixture, whisking often, until it feels warm to the touch and sugar is dissolved, 3 to 5 minutes. Transfer bowl to the mixer, and fit with the whisk attachment. Whip on high speed until mixture is stiff and shiny, 3 to 5 minutes. Add butter, one piece at a time, and continue mixing until butter is thoroughly incorporated. The filling can be kept, covered and refrigerated, up to 1 week. Bring to room temperature before stirring. Once that is the right consistency (I had to chill it in the fridge for a bit), go ahead and start piping. High on our glorious victory of poofy pink macarons with their adorable little pied, we whipped up a second purple batch accented with sprinkles that didn't quite turn out as well as we hoped because we didn't do the double pan trick. This resulted in slightly browned bottoms, domed tops and cracks. Shucks! They still tasted like heaven, though. No complaints there. SO...who's going to give this infamous little cookie a try? Let me know how it goes if you do! completely totally impressed.wow.off to paris for you! i was needing this is my life. 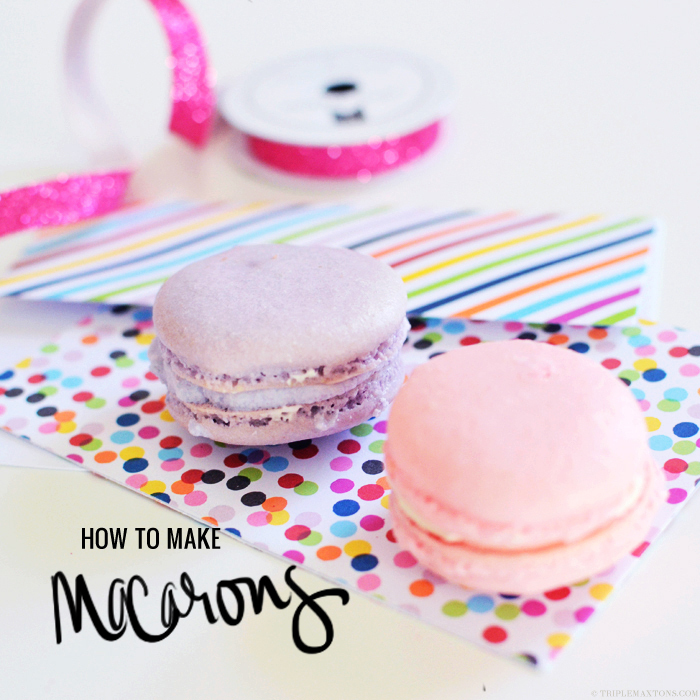 I love Macarons but have been hesitant on making them on my own, might have to try though. I feel like I'm the only person left on earth who wasn't had a macaron yet. They looks really good! I definitely have to give macaron baking a try. I don't particularly love them but they are great to serve at parties.